What accounts for the enormous variety of plumages displayed by birds? From the vibrant and eye-catching colours of the macaws to the elaborate design of peacock tails, for biologists this richness and diversity has always been a mystery, not only between species but also between different populations of the same bird. Recent research has clarified where the complex designs of the plumage come from, and to what extent they are written in the genes or depend on environmental factors. The colouration of birds comes mainly from three groups of pigments: carotenoids, melanins and porphyrins. Carotenoids are compounds of plant origin (only produced by plants and algae), which implies that if a bird has carotenoids in its feathers it is because it has fed on plants that contain them, or on animals that had previously ingested them. Once assimilated, these carotenoids travel through the bloodstream to reach the dermal follicles from which the feathers develop; these follicles supply the growing feathers with blood and with colour. Carotenoids are the pigments responsible for the yellow, orange and red tones, in addition to different shades of green, such as olive, when combined with melanins. As in the case of the female scarlet tanager (Piranga olivacea). Due to their exogenous origin, the greater or lesser presence and concentration of these pigments in the organism—and therefore, their effect or participation in the final colouration of the plumage of birds—depends on the availability of the source of carotenoids. This is the only way to explain the enormous variability that can be seen in the colour of the plumage in populations of the same species that have established themselves in different places, and even among individuals of the same population, depending on their ability to obtain food. We can then understand why the colouration of birds is subject to seasonal variations and other environmental factors. 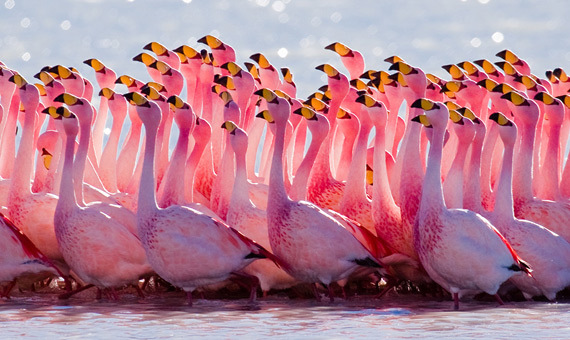 One of the most striking cases is that of flamingos, to the extent that in zoos they are usually feeded with a supplemented diet rich in carotenoids to enhance their colors. Unlike carotenoids, there are other pigments that animals (including birds) can produce themselves: the melanins, which generate different tones of black, brown, grey, earth… They are the same type of substances that also produce the different skin tones and colours exhibited by humans. 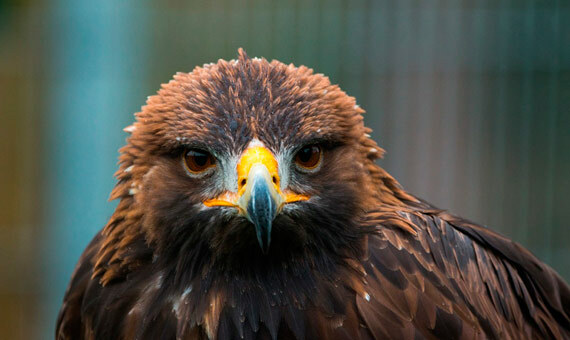 Some examples of birds that owe their coloration to melanins are the real owl or the golden eagle. Melanins are produced inside specialized cells, called melanocytes. It is the only plumage colouring mechanism that is genetically encoded and is controlled directly at the cellular level. The genetic code hides the complex patterns of the plumage of many birds. These colourful designs are expressed by modulating the presence, location, concentration, differentiation and even activation of the melanocytes in the follicles in which the feathers develop. The need to regulate the presence of melanins at the cellular level is due not only to their ability to provide colour. In the case of birds, these pigments play another crucial role, since their presence increases the toughness of the feathers. This explains why even those species with an almost pure white plumage (like the swans and the albatrosses and petrels) display black tips and edges on their wings, as these are the feathers that are most exposed and damaged during flight. 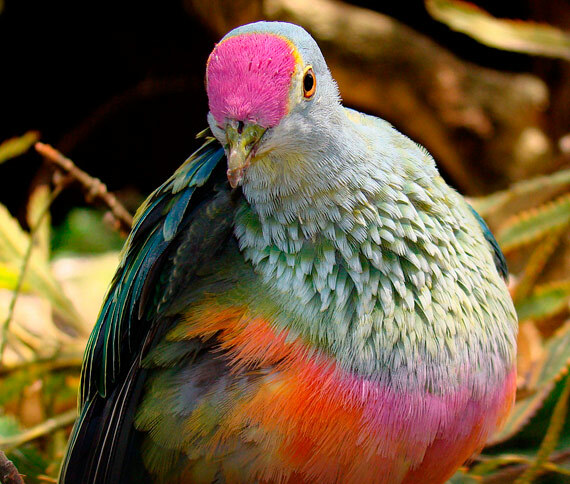 Porphyrins are responsible for the vibrant pinks, reds, browns and greens of many gallinaceous species (such as the peacock) and pigeons. 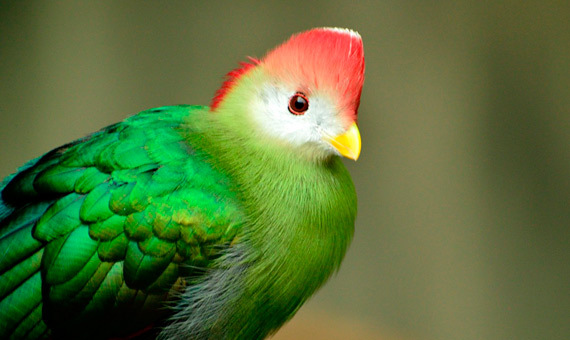 Psittacofulvin and turacin are pigments that are even more exclusive: the former only appear in the order Psittaciformes (birds typical of the tropical regions, like parrots, cockatoos and macaws); the latter is typical of turacos. 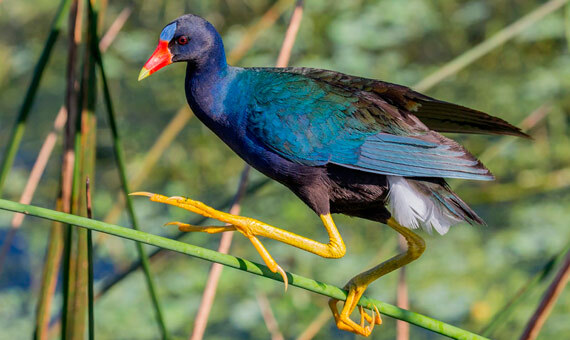 Both pigments are the origin of the intense greens and reds that distinguish these birds. These three types of pigments are exceptional for three reasons: for their bright and intense colours, because they are unique to a few groups of birds and because these birds synthesise them after having developed specific processes. Following these metabolic pathways, the most exotic birds modify the structure of carotenoids, and therefore their colour, to generate porphyrins, psittacofulvins and turacins. Thus the presence and influence of these special pigments also depends on the availability of foods rich in carotenoids. In addition to pigments, there is another way in which birds colour their plumage. These other colours are generated as a result of the presence of specific nanostructures in the feathers’ barbs, which modify the properties of the incident light when refracted or dispersed. The iridescent plumages that, for example, characterize the throats of hummingbirds are caused by the existence of a type of nanostructure that acts as a prism, breaking down the sunlight, which causes iridescence and makes the appearance vary depending on the angle of view. There are other types of nanostructures, such tiny sacs or pockets full of air, that disperse part of the incident radiation—in an effect analogous to that which occurs in the atmosphere and which colours the sky blue. These nanopouches are responsible for the plumages that distinguish (and provide the name for) birds such as the Western bluebird or the Mountain bluebird. The range of colours also increases when the presence of these nanostructures is combined with that of melanin granules. The appearance of these nanostructures in plumage is not controlled directly at the cellular level. It is an autonomous or self-directed process—technically, an induced self-assembly—by which they are generated in a random manner during the development phase of each feather. And that randomness makes it impossible for them to generate complex patterns or designs. In 2017, a team of Spanish scientists from the CSIC found that practically all the patterns exhibited by birds in their plumages arise from the presence and activation of melanins. For their study, the researchers defined a “complex design or pattern” as the combination of two or more discernible colours, which is repeated in the space more than twice in an uninterrupted manner. And that repetitive scheme can occur within the same feather or be produced by the combination of adjacent feathers. Specifically, of the more than 9,000 species analysed and representative of all bird orders, 32% exhibited this type of pattern. And only in 53 species—one species of stork, 37 species of tropical pigeons and 15 of cotingas— were these designs not based on melanins. Of these, all displayed striking and unusually intense colours. And all of them belong to one of three families of birds (Ciconiidae, Columbidae and Cotingidae) that have been able to develop metabolic pathways to modify the structure of carotenoids. This mechanism seems to suggest, according to the researchers, some kind of evolutionary adaptation. Thus, the presence of a complex eye-catching pattern would offer some advantage, which could well be to ensure the success of courtship (and, therefore, the reproduction of the species), or serve as a visual code to resolve territorial and hierarchical conflicts without the need to fight, or as a warning or threat to potential enemies and predators.